You wake up on an island; your boat shattered, your sword swept away by the storm that caused the crash. And at first, it almost doesn't seem like a bad thing. The islanders are kind enough (one girl in particular has caught your eye) and Mabe Village is one of the cozier little towns you've visited. The cozy feeling doesn't last long. The villagers, while generally good-natured, seem to be completely oblivious to life outside of their little island, and when you start asking questions, you realise that none of them can remember how and when they ever got to this island in the first place. A mysterious talking owl appears to be watching you at all times, and he tells you that the only way to escape this twisted place is by awakening an equally mysterious creature known as The Wind Fish. The world isn't in danger, no princess needs to be saved, no force of unspeakable evil needs to be dispelled. The only thing driving you forward is a question: what exactly is Koholint Island? 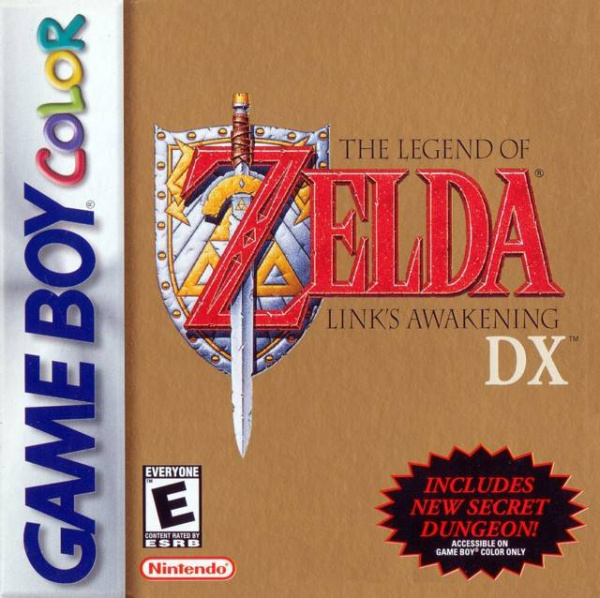 It's a decidedly different approach to the typical Zelda “unassuming boy from a small town becomes a noble hero and saves the world” story, and even though it's still structurally very similar to other titles in the series — you still tackle dungeons, acquire new items and engage in a variety of sidequests — The Legend of Zelda: Link's Awakening DX's combination of enigma and charm still make it stand out as one of the best Zelda titles to date. Now, if that description of the story up there sounded dark and heavy-handed, don't worry: Link's Awakening never gets bogged down in its mystery or symbolism (even if there is an awful lot of the latter). In fact it stands out as one of the most light-hearted and whimsical Zeldas in the series, thanks in no small part to its timelessly charming presentation. The Game Boy didn't have the most impressive horsepower, even at the time, but apparently nobody told Nintendo, because it still stands out as one of the best-looking games the company has ever made from an artistic standpoint. The game's spritework is still charming enough to bring a smile to your face, and the level of detail and expression in these little characters is only outdone by the surprising size of the overworld. It may be called Koholint Island, but don't think that means that it's the size of one of Wind Waker's or Phantom Hourglass's little patches of land — this is a big game, whose overworld rivals the size of A Link to the Past and almost surpasses it in terms of density. Not a single screen of Koholint Island has been underutilised, meaning it's absolutely packed with enemies, secret passageways, characters to interact with and new upgrades to find. You could blast through the main adventure in six or seven hours if you're a Zelda vet, but if you take time to explore the island and find all the Secret Seashells (collect them all and “something good is bound to happen!”) it's not a stretch to say you've got over 20 hours worth of content, here. Not too shabby for a $6 downloadable game that came out almost two decades ago. At this year's E3, Miyamoto said that he felt that Link's Awakening was the Zelda title that found the development team at the most unbridled in their creativity, and that definitely shows in the game's fiendishly clever dungeons — note that we said fiendishly clever, not fiendishly difficult. The puzzles found here can be absolutely mind-bending, and in terms of pacing and difficulty curve, this is among the best games in the series. Not only does the game jump right into the action, but there's a perfectly steady increase in complexity (unlike Link to the Past, where the difficulty can take huge leaps either up or down from dungeon to dungeon) making it a great entry point for newcomers looking to see what the series is all about. The balance between combat and puzzles in these dungeons is just about as perfect as you can get, and there's also a number of platforming-based sidescrolling sections — a nice nod to The Adventure of Link. And although the game certainly didn't need any tweaking, it actually ends up playing even better on the 3DS. The Circle Pad makes controlling Link much more fluid, for one thing, and the game benefits greatly from Restore Points, which allow you to pick up and play directly from where you left off (although if your system is still experiencing frequent black-screen error messages, you might want to stick with regular saves as these crashes can corrupt your data). If you see a part of the map that you can't access yet but you want to remember later, you can tap the Home button and make a quick note of it using the 3DS' “Game Notes” option on the system's top menu; and if you get really stuck, you can hop on the Internet browser and look up a strategy guide without ever losing your progress, although just know that if you do use a guide, you're a cheater and we'll think less of you. Link's Awakening is a game of contrasts: sadness and joy, bleakness and whimsy, dream and reality, confusion and comfort. Its success lies in its ability to balance these contradictory elements with tight, compelling gameplay and a timeless presentation. If you own a 3DS, this is a game you simply need to try, because downloadable 2D Game Boy title or not, this is among the best games available on the system. Fantastic game. This is my favourite Zelda of all time and its even more fun then the Snes version. Seeing this makes me want a 3DS as there will be no battery backup problems. I remember the original gameboy zelda version of this where you could teleport by hitting the select button at the end of the screen. Was of course fixed in DX. Wow, is it really that good? I was expecting a 9, not a 10. I'll definitely get this at some point but SML will be my first 3DS vc game. Wow! Two 10/10 3DS reviews in a row! I picked this one up just because everyone was saying how great it was. Normally I am quite opposed to 2D Zeldas but I took a leap of faith...and boy am I glad I did! I'm only about 4 hours in but this game is really fantastic! So worth the 6 dollar premium! I totally agree with this score; this is 2D Zelda perfection. I'm playing this through for the first time and I'm amazed at how the designers managed to constantly keep things fresh and new. @3 this game is that good. 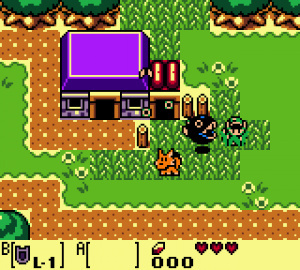 Its hands down the best zelda game in my humble opinion and easily the best gameboy / gbc game. I cant do it justice in my explanation but just get it. 6 dollars..... A steal. It actually looks and sounds like a 16 bit game. Real nintendo magic in this game. This is one game that is truly timeless. The game that made me love Zelda! I actually played this before a Link to the past. Only took an hour into it and I was hooked. Been a Zelda fan ever since. Do not pass this up. Even if you're not a huge Zelda fan by the time you finish I bet you will be. Another 10 for Zelda games! O_o Are you sure Nintendo workers aren't writing these? I always felt it was too easy to get lost in this one, and things were too confusing. Anyway, great review and great game. Two Zelda 10/10 reviews on the same day. And both for the 3DS. Feels a bit generous to me but it seems that's just how NL rolls. This is truly one of the best Zelda games ever made. This is my first time playing this, and it is indescriably awesome! I have put more than thirty hours into this, and I still have not completed it! Great review by the way. This is the first time I played this game and I'm almost near the end. As for 10/10, well, I don't think it's necessarily perfect as there is some issues I have with it (saving the game must have been a pain back then). Because I'm close to finishing this game, I would give it a solid 8 out of ten. @Mickeymac- What?! This was probably the one Zelda game that I felt like I clearly knew what to do next. As long as you pay attention to what they say after you beat a dungeon, you'll know what to do. Anyway, this is an instant classic that deserves a download for anyone who owns a 3DS. Yes!!!! Thank you! I was so nervous about seeing the score, it finally gets the credit it deserves and get new players too! WHY o WHY does Nintendo just not release these Gameboy games ON a DSiVC aswell. I'm not a Zelda fan, but this is the one Zelda game for which I make an exception. This is right up there with Pokémon G/S/C as one of the best GB(C) games ever. @billy-beauts: Zelda for the Wii U is just a demo, Nintendo did the same thing when the Gamecube was announced then they went on to make Wind Waker which was nothing like the demo and had many people disappointed. I'm on my first real playthrough of this and I've just entered the 8th dungeon with 14 hours of playtime. I've got every piece of heart except one, the secret seashells reward, the bomb bag, quiver and magic upgrades, and the magnifying lens. I'm enjoying the hell out of it and can't find fault with the 10/10 score at all. This game is incredible. When I played it on my GameBoy for the very first first time, I felt an overwhelming rush of nostalgia. To this day, no other game has done that to me. The atmosphere is full of mystery and wonder, despite the silly, picture book presentation. This was just a fun diversion that wasn't supposed to be an epic adventure like its predecessors, but it became one anyway. I cheated when I couldn´t find a guy who wanted to trade my hook. The fisherman in the village didn´t want it. It´s nice that the game doesn´t lead you from one point to another but finding that guy who wanted my hook was just ridiculous (I´m not gonna spoil here where that aubergine was hiding). I think I like Oracle games bit more, because you could actually figure out where to go next (I cleared Ages as a kid, when I didn´t know about Gamefaqs). Such an amazing game on such an amazing system. Good times! 10? I liked it, but i would give it about 8 or 8.5, it's not as good as Ocarina. An excellent review that hits all the important points succinctly. I'm ecstatic to see all this love for Link's Awakening... this game had a more powerful effect on me than probably any other during my childhood. It was only my second Zelda, since I skipped Zelda II and didn't have an SNES, and it's great to be able to replay it now in color, which I never had a chance to do before. I also agree that this is a much tighter game than ALttP, and it's easy to make the case that the 2D Zelda formula met its perfection here. Wonderful puzzles and adventuring throughout, and as you say, every screen has something to do, and every location feels new. I recently beat the monochrome version but I must get this coloured version as soon as I get a 3DS and play that as well. Thanks for the kind words I never knew about Koizumi's involvement in Galaxy before you tied that all together, but if that's the case then he should really do more stories for Nintendo because he's clearly great at what he does. I agree wholeheartedly with that 10/10. This game is what zelda is really about. The game story and pace flows far better than any other zelda, especially over LTTP. The beatuiful spritework should put whoever the art designer for the DS zelda games to shame. The music is some of the best of its style, and its crazy to think some of this music was coming out of a game boy! I just had to stop and listen for ages when I heard tal tal heights again properly for the first time in so many years. I can honestly say nintendo may have made a mistake releasing the game this early on the VC. When you start with probably the best game on the GB/GBC/GBA line, where do you go from there? This was my first Zelda game that I got, I picked up as soon as it was on eShop so as you can see I am pretty new to the series, I like but I would have to give this a 9.5. I love a the Mario references in this game. this was my introduction to the zelda series. i remember getting my gbc for christmas with this and super mario bros dx(VC please!) and I've never been happier. An absolute blast of a zelda game!!! Whilst this game does have some slight annoyances (the same help pop-up for the millionth time when you touch an object without the right item equipped), it definitely deserves it's score here. I've finished this game more times than I can remember yet I forked out the money to play it again without any hesitation whatsoever. Now this rating I agree with more. This game deserves a 10 much more than Ocarina of Time does. This game was one of my all-time favorites, but I do disagree with one point in particular: "the game certainly didn't need any tweaking". The game actually explained a lot for something of its time period, even containing a hint system (though you still have to wander around a fair bit), but how is one to know that you need to get Yoshi from a vending machine, spawning a mini-quest in order to advance the plot? I don't believe Ulrira mentions this at all. There are minor instances throughout the game where bits of extra dialog would go a long way. The DX version also removes the ability to skip conversations. While that's inoffensive in theory, it appears that every time you touch a rock or the "weird objects", you have to read the text, so skipping would be useful here. What's far more annoying, though, is that you can only carry two items at once. It's forgivable since it was on a system with four buttons total, but Link's Awakening would benefit from a bottom screen inventory. Far too much time is spent fiddling around with items, especially when you have to use Pegasus boots+Roc's Cape. Lastly, save issues and not-so-infrequent game crashes have been experienced, such as when I jumped on a fish in the fifth dungeon and the 3DS practically blew up (had to force-power down). I don't mind the glitches for nostalgia's sake, but it appears this port has its own kinks to work out? I'm not saying the game needed updates for a $6 port, of course, but if there is a Zelda that deserves a remake, it's this one. I'd love to see Link's Awakening "remastered". My parents never bought me the retail version of this game when i was little, i am so glad i can play it now. It's been running flawlessly and it's of dream-making quality. I wish more modern games were like this. Yes, but I mean how is one supposed to know that it's part of the plot? It gives off more of a sidequest vibe. There are other characters who seek items that come after Yoshi, which are unobtainable until getting Yoshi, thus potentially confusing the player. Where is the EURO price?! 10/10!! I knew about its note. This Zelda is a real masterpiece. This game was pure awesomeness back in the day. I had it for my Gameboy Color. If I had a 3DS I would download it for sure. For people questioning the score, it's definitely deserving of its 10/10 score. @ImDiggerDan"Whilst this game does have some slight annoyances (the same help pop-up for the millionth time when you touch an object without the right item equipped), it definitely deserves it's score here." Just recently played through this on my GBA SP and man I agree that reocurring pop-up was annoying!!! Good game, fun, but disappointing ending. I like A Link to the Past much more. This was definitely a must play Zelda game... it was the first to really change the usual story up. I was skeptical on buying this game, but you've got my mind set on it now. Thanks for the review! Hope I enjoy it.. This game was already going to be my first paid download but this just re-enforces my decision! Reading this review made me want to play my copy... only to find that it doesn't hold a save anymore looks like this will be my first 3DS virtual console purchase! 8-9 would kill this one dead. I've been playing it and although I like it, a 10 it's not (to me anyhow). The story is kinda silly in this one and it's very similar to A Link to the Past, another game I feel is a bit overrated. Bought this the first day. I love that they released this one for the gameboy color instead of the original. I totally agree with the 10. Best 2D Zelda ever made. 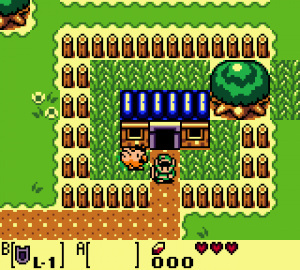 ALttP may be more popular, and the Oracles games may be newer, but as far as putting everything together as a total package Link's Awakening just has a certain magic to it. The self-referential humor, the constant cameos, the way the mystery of the island unfolds, it all just works. The ending also made me tear up as a kid. It's like Chrono Trigger in the way it can be light-hearted and hilarious one minute and then gut-wrenchingly emotional the next. Most Zelda games miss out on that humor aspect actually. Link's Awakening pulled it off perfectly, and they didn't even need Tingle to do it. Will get this as soon as I get my 3DS. I just finished replaying through Link to the Past so this sounds really good. I wasn't going to buy this cause I actually still have the original cartridge. But I am SO glad that I did! The Restore Points make this game better than ever and I can't wait to get more VC games for the same reason! I'm blasting through the game cause of the Restore Points saving me so much time. It's fantastic! I also love that I can make a restore point and wander around and explore and if it's a dead end I just hit the restore point again or if I have half a heart left and no other options i'll do that as a safety net. Definitely the best Zelda for a handheld and maybe the best Gameboy game of all time. I don't support the censorship in the DX version though especially since the original European release (black & white) didn't include any of these alterations (which are present in all American releases). As much as I like the games of Nintendo but the censorship policies were just ridiculous. I'm going to buy my 3DS before free Excitebike turns into non-free game and I'm pretty sure that my first game will be Ocarina of Time 3D as Mario games aren't released before winter, and I'm going to get this game too soon after buying 3DS. I like top-view Zelda games more. I've finished Minish Cap and Phantom Hourgalss and Zelda 1 is close too. Those games were very good. I don't like Ocarina of Time so much but I thought that if it would change when I get the 3DS version (I own N64 version on Wii). I have played Wind Waker which looked like a good game but I don't have it. I was so engrossed in this game as a child. I think this has far more charm than Link to the Past, in the same way Ocarina is a much more charming experience than Twilight Princess. I loved the references to Mario and Kirby as well. They need to make a 3D Zelda with an over-world as dense as Koholint. Best gameboy game there was. Bought it on the EShop again right away, though I'd have been so much happier, had this been one of the 3D Classics as well. Playing it at the moment, and really enjoying it so far. My favorite portable Zelda game just slightly ahead of minish cap. It was and is a great game deserving of the score it got! I haven't downloaded it yet cus I was saving up for oot but I need to go out and get a points card just for this. Good thing is I only have to spend 10$ instead of 20z. Unfortunately the two best gameboy games have been released so far and it only goes downhill from there! Not bad games but when you release the very best to start you have a lot to live up to. I have and I prefer those bit more cuz they don´t have a confusing trading quest that you think is just a side mission. It was the terrain that I found confusing. I was always getting lost, and I know I'm not the only one with this problem. @andyutd97 - It's GameBoy Color. It's just a little difference between the word in British and American English, and GameBoy uses the American style. @mickeymac their is the map. And if you don't know where the next dungeon is or where you need to go you can go to a phonehouse where the game will give you a hint or check the library atlas whic has a map of everwhere you haven't been. Even with the map, I still didn't know where to go, and this is coming from someone who never gets lost in Metroid games. The terrain is just confusing. It's like trying to get through a goddamn maze. Does it have the pictures we used to print in the gameboy printer?? You can still get your picture taken but you can't print the photos. This game is fun, but definitely not up to par with games that are out now. Since the first time I played this game was last weekend after downloading it on the 3DS, I would rate it 8/10. Ever since the 3DS eShop was anounced this is the one I hoped would arrive sooner rather than later. Can't believe it is one of the first! Not only the best Gameboy game ever but one of the best games ever on ANY console in my opinion. I can't imagine any 3DS owner not wanting to play this piece of Nintendo gaming history! Now let's have Monster Max. This game reminded me that we need Ages and Seasons available for download. Those games have yet to be rereleased and I quite enjoyed them back in the day. My favorite game for the GBC! I've beaten this game so many times I lost count... Great review! This game has been thoroughly enjoyable and worth the purchase. It was one of the few zelda games i never played. If someone can help me though if they have come across this problem yet. I am in the 8th dungeon and I am completely stuck. I have received 3 keys and according to the map on gamefaqs i should have only used 2 so far. I have none in my inventory and I am at the locked door that brings you to the room in front of the nightmare room. I am too the point of asking for a refund because I think their is a glitch. God, I picked this up a couple weeks ago, I'm not even past the first dungeon! I need to get up to date on all my games! Broke down and bough it, pure old school action adventure fun! Just got my 3DS and now playing through this for the first time. Awesome game, love it! I just beat the hard copy my friend let me borrow, and now I've beaten it I'll still consiidering having it around on my 3DS. Really enjoyed it, but not sure I want to spend $6 on it seeing as I already beat it. The Legend of Zelda: Link's Awakening DX is an all-time Game Boy classic by Nintendo. The game has amazing graphics, an engaging storyline, and a memorable soundtrack by Kazumi Totaka. The dungeons stand out as cleverly designed and challenging, not to mention there's a nice balance between puzzles, combat and some platforming. There's something about the various Nintendo references that put a smile on my face like the Mario and Kirby references (Yoshi, Princess Peach, Mamu, and Kirby), Prince Richard from the Japan-only For the Frog the Bell Tolls (Link's Awakening is a spiritual successor to that game), and Dr. Wright from the SNES SimCity. Next to Donkey Kong '94, Link's Awakening DX is an outstanding masterpiece and a worthwhile experience on the 3DS Virtual Console. A very good game I am loving it so far. Restore points are getting alot of use. After Enjoying Anniversary edition of Four Swords the thought of getting this really appeals to me. I use guides.... Not everyone is patient enough to figure it out on their own. Plus I don't like getting frustrated- which I do easily- so guides help make the experience more fun and less aggravating. I don't like how often NL reviews insult certain kinds of players. You guys may mean it jokingly, but it's not funny. It just makes people feel bad and makes you guys come off as kind of 'video game elitists' who think poorly of less obsessed players. Wow, 10/10. Picking this up when i get an eShop card. This is the best Zelda game ever,it also has the best video game map!!!! Get a stick... find a honeycomb... take the honeycomb to some guy... you get a pineapple... take the pineapple to a random guy miles away from where you are (with NO hint as to where to go), then you get a letter (amazingly it tells you where to take it!)... then... a broom?!? What in god's name am I gonna do with a broom?! Is this a joke? And it goes on... it is utterly tedious, every item is miles away from the last, there is hardly ever a hint... it's about as fun as hugging a boa constrictor. To make it all worse the world is labyrinthine, it's a complete maze. The map is useless. The majority of the game is spend aimlessly wandering around because the signposting is so shockingly bad (I mean amazingly bad, I mean the worst signposting of all time!). Unlike A Link To The Past which is open and confusion free it is borderline impossible to remember the route you're meant to take to get from A to B. The dungeons are mediocre (but the highlights of the game), with puzzles that are counter logical nonsense. The bosses are quite good but most have been ripped right out of A Link To The Past. This is a truly woeful game, it has nothing to do with the platform, some of the design decisions that were made here are baffling to say the least, but downright stupid would fit the bill better! It's a good job i'm not writing the review because I would give this a 3/10 score and believe me that is generous. This joins my list of most overrated games of all time, along with Uncharted 2 and Final Fantasy XII. A terrible game, not worth the virtual store price tag, not worth the Zelda moniker. DO NOT BUY. Anyways with that outta the way, yes this game is amazing. I have a hard picking an all time favorite Zelda game. OoT, ALttP, MM, LADX pretty much all tie for that. But I can say without a doubt that all handheld Zelda games are masterpieces... Well excluding Phantom Hourglass and Spirit Tracks. I'm sorry but no one will ever convince me that those were good games. And the petulance rolls on. Anyone that loves something is a 'fanboy', anyone that dislikes something is a 'troll', gamers, eternally steadfast in their bigotry. The belief that anyone that doesn't agree with the critics is objectively in the wrong. I do not like this game. I thought it was dire. That is my opinion. I am not a troll. I love Nintendo. But I strongly dislike this game. I spoke my mind. And you brand me a troll. Because in gaming, people aren't allowed an opinion. This is the worst Zelda that I have ever played. If saying what I think makes me a troll. Then perhaps I should find a bridge and live under it. The Legend of Zelda: Link’s Awakening is a game from the Legend of Zelda series. 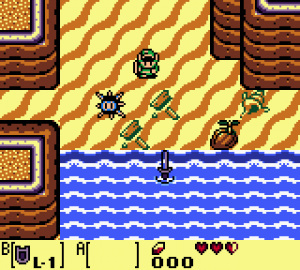 In this game, the main protagonist, Link, is drifted to a isolated Koholint Island after defeating Ganon in his home realm Hyrule. He is taken to Tarin’s house by his daughter, Marin. Marin is excited to learn about the outside world, and shares with Link that if she was a seagull, she would leave Koholint Island and explore other places. After going around the local town and meeting all the folk, Link is given the task of waking the Wind Fish. This can be done by collecting the eight instrument located in dungeons on Koholint Island. 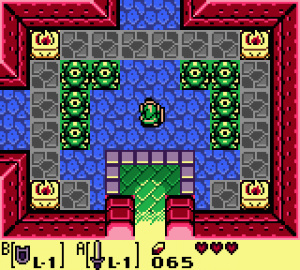 By collecting different items along the way, Link progresses through these dungeons. Many residents of Koholint Island help Link along the way. A witch gives Link magic powder in exchange for toadstools found in the Mysterious Forest. This magic powder can be used to light torches, which is used to solve puzzles in different dungeons. This magic powder also kills enemies that Link can’t kill with his sword. The magic powder has different effects on different enemies. The enemy Buzz Blob turns into Cukeman when magic powder is used on him. Cukeman has dialogue that he speaks to Link rather than attempting to hurt Link. Throughout his journey, he begins to learn more about the lore of Koholint Island. He discovers that by waking the Wind Fish, he will return home, but Koholint Island and everybody on it will disappear. Link faces a dilemma: he can either stay on this island forever, or he can end the lives of everyone else on this island. The villagers of the island urge him to continue with his quest, but the guilt he carries slows him down along the way. Link makes his way to the final dungeon, Turtle Rock, Link defeats the boss there and gets the eighth instrument. Link climbs up Mt. Tamaranch and uses all eight instruments to play Ballad of the Wind Fish. This song cracks open the egg of the Wind Fish and allows Link to go inside of it. After going through a confusing maze, Link reaches the final nightmare. The Nightmare takes forms of different things that Link is scared of, such as Ganon. The Nightmare takes its final form, Dethl. After defeating Dethl, Link discovers that the Owl he met previously on his journey is the spirit of the Wind Fish. After Link plays the Ballad of the Wind Fish once more, the Wind Fish awakens, and Koholint Island and all of its residents disappear. If the game is completed without any deaths, Marin can be seen in the end cutscene, flying away in the form of the seagull. Link’s Awakening is an amazing game. The game contains difficult puzzles and amusing dialogue, topped off with a fun combat system. The open world of Koholint Island allows the game to be played in different ways. Not only is the game itself great, but the lore surrounding it is beautiful. In Link’s Awakening there are so many NPCs you can interact with. All these characters have their own motives and ideas, they have reasons for wanting to stay on the island or for wanting to leave the island. You can’t help but feel sympathetic for the residents of Koholint Island. This game is a must-play for anyone interested in retro games. I rate this game 5/5 stars.